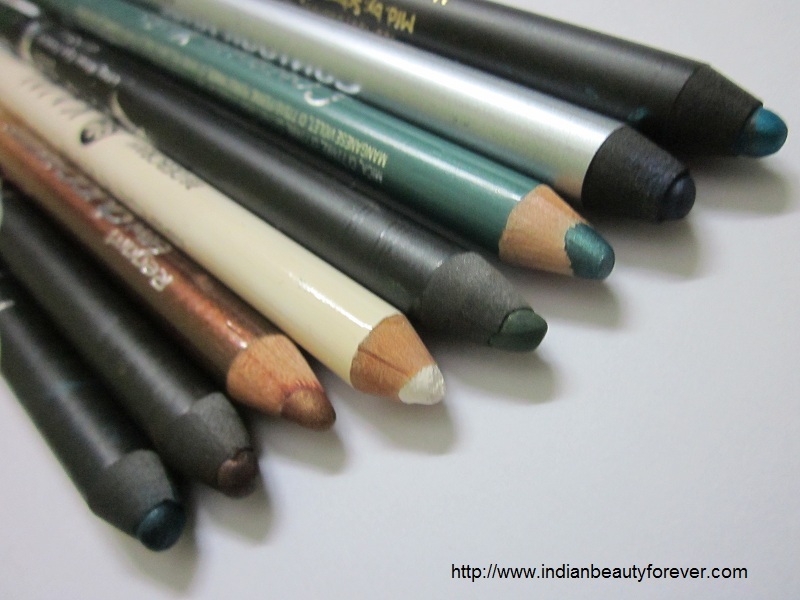 In this post I will be swatching 8 eyeliner pencils from different brands. I have already done the reviews for all of them except for the L’Oreal contour Kohl in Aqua blue. I will do the review and Eye swatches of that one soon. 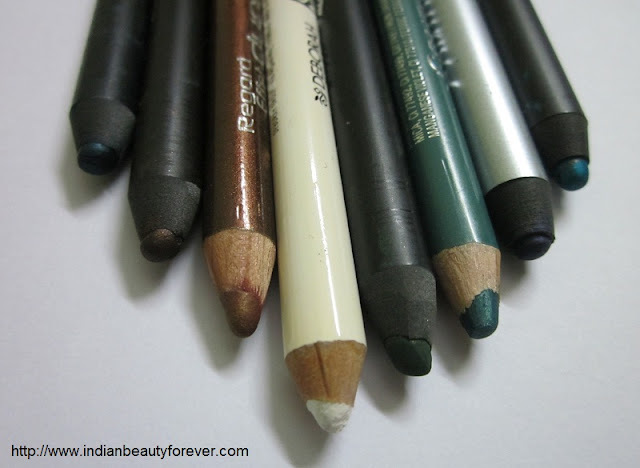 Here are the 8 eye pencil which includes, brown, white, turquoise and green. I have not included the black pencils since will do a separate post on that. Here are the swatches that have been labels as umbers. Do refer the above list for details. 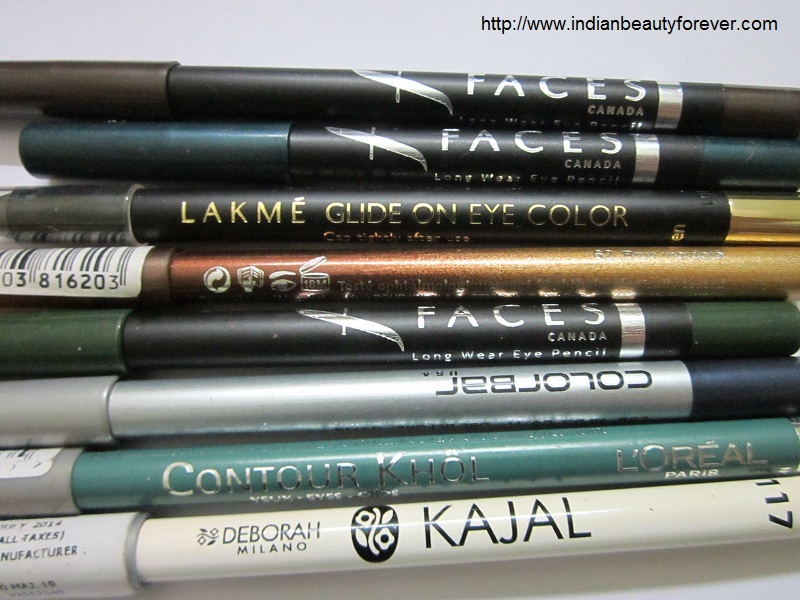 I absolutely love all the colors of these eye liner pencils and hard to choose which one is better. However, product wise if I have to chose then Faces Canada eye pencils are sure shot winners. Due to their awesome pigmentation, texture and the superb staying power they are the best. Moreover, all that at an affordable price. They just glide like butter and it feels that in one swipe they will be removed but no once they set they are like smudge proof and water proof. They are my most used pencils and of course my best eyeliner with no smudge. I am sure those of you who have used them, will agree with me. These days no more oranges now, I am more in love with the purples, hence, wants to try their purple one. I think they have raised their prices recently. Hope you liked the swatches!! i love the swatches and pics too darling !! i will suggest for your waterline go for Maybelline colossal one which has turned into a must have product or else try Lakme iconic which is a close competitor to colossal. Thank you Shikha. :) same here .. I haven't used any of these. You have a nice collection. I just ordered some new eyeliners and I'm looking forward to using them! he he ...:))) i want more too..